Province of Tierra del Fuego Antártida e Islas del Atlántico Sur. Ushuaia is the capital of the Tierra del Fuego province, and has a population of about 58.000. The main economic activities are cattle breeding, tourism, the production and assembly of home appliances and fishing activities as a base for longliners and trawlers and local crab fishing. Road communication with the continent is through highway Nº3, which enters Chilean territory up to the Magallanes Strait (crossed by ferry). The local airport serves domestic and international carriers. 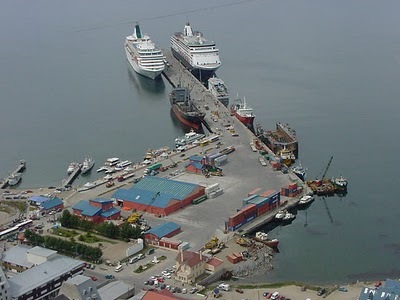 This port lies on the NW side of the Ushuaia Bay and consists of the commercial pier, which has been considerably extended the Naval Base pier, and the Orion oil jetty. 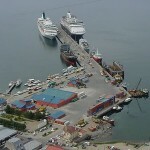 Ushuaia is also a Naval Base and the Argentine Navy has a small floating dry-dock moored at the western end of the commercial pier on its south side. There are ongoing studies to re design the port, including passenger terminal, container, gencargo and naval repair areas. 1) The commercial pier juts out into the bay in a SSE direction (see map); it has a berthing front of 679 m on the south side and 517 m on the north side, with an additional mooring dolphin located a further 28 m beyond the pier; it was also broadened to a width of 28 m. The pier is built on a shelving beach and depth at datum alongside is 9,80/10,40 m (32/34 ft) at the eastern end and 3,80/6,10 m (12/20 ft) at the western end. 2) The Naval Base pier, about 0,3 miles NE from Commercial pier, 80 m long, for exclusive use of small navy vessels. 3) The Orion oil jetty, situated about 0,5 miles NE of the Commercial pier. It is a narrow “T” shaped jetty extending about 85 m from the shore with a frontage of 30 m at its head, 10 m width and fitted with outlying mooring points. It is used by coastal tankers to discharge CPP for local Tierra del Fuego consumption to shore storage tanks. Ships berth starboard side to the jetty and depth alongside is about 9,60 m (32 ft) at datum. The berth is occasionally used by small passenger ships or vessels taking bunkers directly at the jetty. (see Bunkers). a) Tourism: A considerable number of passenger vessels call between December and March, mostly taking passengers on Antarctic cruises. A minimum of five days berthing notice is required by the port authorities, cruise vessels having absolute berthing priority. When these vessels cannot berth alongside due to weather conditions they usually anchor close in at anchorages indicated on the chart within the 10-20 fathom lines. During the 2010 – 2011 season, a total of 275 entries were registered. b) General cargoes, for the most part connected with the electrical industry, are shipped almost entirely in containers; container movement in 2011 amounted to abt. 36.000 units. c) Fishing: This is presently carried out by locally based vessels which transship their catch directly to foreign flag reefer vessels whilst moored to the pier with the receiving vessel lying second off. Exports in 2011 amounted to 1.640 tons, including local factories products. a) Vessels arriving at the eastern end of the Beagle Channel: 1,5 miles off Moat Point, or adjacent to Cape San Pío, or in the case of bad weather in the shelter of Slogget Bay. b) If arriving from the west the pilot is taken off Roca Perón at the demarcation of the Chilean/Argentine jurisdiction. c) Vessels proceeding from the Chilean port of Port Williams take the Argentine Ushuaia port pilot at Les Eclaireurs. Ushuaia is located in a relatively sheltered bay, however gale force winds can often be encountered, particularly from the west and south. Even though weather predictions are acceptably accurate, conditions may vary unexpectedly. There are two stevedoring companies and one cooperative offering their services working in shifts of 6 or 8 hours with overtime weeknights +50%, weekends +100%. Notwithstanding this, cooperatives frequently quote an all in tonnage rate for the job. June 1st and October 12th. Available at Regional Hospital and one private clinic, including emergency ambulance service in port area via VHF channel 6. Provincial ambulance-plane available in emergency. Also pilot boat or PNA craft can attend for emergencies within the bay. 20 are available of different categories. Bookings 30 days in advance advisable during summer season. Daily flights to/from Buenos Aires, Río Grande, El Calafate and Río Gallegos as well as Punta Arenas in the summer months. Gasoil available from Orion Repsol-YPF pier/storage tanks and supplied to commercial pier by truck. In case of need vessels of up to 150 m LOA and around 30 ft draft can berth directly alongside the Orion jetty to bunker. Fuel oil presently not obtainable. All arrangements, either locally or with brokers at Buenos Aires should be made in plenty of time. Qualified divers available for underwater inspection, etc. Available on the pier at 220/380 V, however connections to the vessels are not available. Available at Commercial pier. Supply rates north side 60 TPH and south side 40 THP. (However, if the pier is occupied by more than one vessel and they are simultaneously taking freshwater the rate will drop accordingly as low as 5/10 TPH). Agents must contact authorities who require to inspect garbage prior to permitting its discharge to refuse skips. Four launches available for transporting passengers/crew/stores to/from vessels at anchor. Seasonal winter zone (April 16th – October 15th) see ILLC. Limited repairs can be carried out. Port administration has 1×0 ton reachstacker, 1×7 ton and 2×2,5 ton forklift truck. Additionally, private contractors have 4×45 ton container top loaders, various mobile cranes and forklift trucks. Available from local Ship-chandlers. Also, if appreciable quantities required by cruise vessels, from chandlers at Buenos Aires or Bahía Blanca. Bonded warehouse of 1300 sqm covered area belonging to Port Administration plus 2 privately owned warehouses available. The Port Administration storage area can accommodate about 800 TEUS and has facilities for 90 reefer containers.